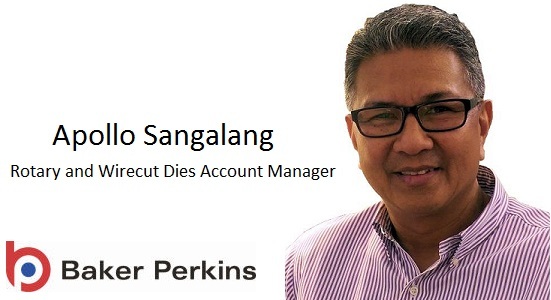 New Die Specialist at Baker Perkins Inc.
Apollo Sangalang has joined Baker Perkins Inc. at Grand Rapids, Michigan as Rotary and Wirecut Dies Account Manager. He will use his 30 years’ experience with specialist die companies Weidenmiller and F & S Engraving to work directly with Baker Perkins’ customers in the cookie, cracker, snack and pet food industries with die design, material selection and problem-solving. Apollo’s experience covers every aspect of die design, development, sales and manufacture. Dies are a critical part of the forming process. They set the product size, shape, weight and thickness. They impart the manufacturer’s unique design and branding, and make a significant contribution to line efficiency. As well as experienced design and manufacturing teams, Baker Perkins’ die customers have access to a fully equipped Innovation Center where they can test-bake new designs. Baker Perkins supplies dies for rotary cutting, rotary moulding, wire cutting and depositing machines of all makes. Dies can be supplied for new or existing equipment throughout its lifetime.